Summer Smiles at Sugar Fix! Hey there Sugar Fix Fans! Getting a great white smile for the summer was the trend at The Loft this week! 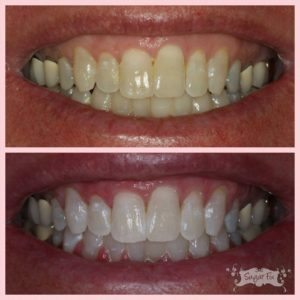 Summer smiles at Sugar Fix are done to achieve optimum white with Zoom whitening. The patient below wanted his posterior crowns replaced and wanted all of his teeth to be a shade that is brighter. Currently, he has porcelain fused to metal crowns (PFM’s). These type of crowns have porcelain on the outside and metal on the inside. This is why you can see at the gum line a silver band, that is the metal underneath. We do not make these types of crowns anymore because of the aesthetic look; now we make an all-porcelain crown with a much stronger material. We will be building up his bite and making crowns that match his new white teeth! Step one is complete and we are excited to have his new smile makeover completed before summer! 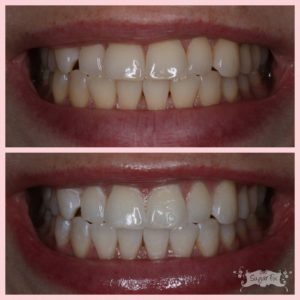 Below is a patient who came in for the Zoom whitening treatment for her upcoming wedding. She has never whitened before and was so excited to have pearly whites for her big day! She had been a big coffee and red wine drinker, but the staining really lifted from the surface of her teeth. The best way to keep up her white teeth is to do touch ups every few months, especially with those staining habits. (You don’t have to give up the red wine & coffee habit!) We wish our bride-to-be the best of luck and can’t wait to see pictures in her white dress with matching white smile! Our Dental Hygienist, Hannah, also had a Zoom whitening treatment this week! She will be traveling to Europe soon and wants to have a brilliant white smile in her pictures! This picture shows our Hannah during her Zoom treatment! Dr. Emery is off to Florida this weekend and we hope that she brings back the amazing weather so we can get summer started already! Until next week! !